A joint collaboration / concept by composer Ben Schwendener and choreographer Angelo Dello Iacona. Gravity Arts presented an interactive performance by the dance company ADN Dialect, along with guest dancers from the Boston dance community and the MOBILE TRIO. Busy with the construction of a perfect tetrahedron, artists improvise and face constant changes of space. It is now time for music and dance to come together in collaborative fusion - No Plan B is a place with no preconceptions or comfort zones, where individuals, through their reactions, show their creativity . A piece that evokes the concept of the present moment and the permanent connection that human beings live with space and forces of the universe. BEN: This project is about spreading and promoting individuality, sharing values, and empowering the unique creative potential of individuals through active collaboration. As musicians and dancers we realize that movement, sound, breath are all interconnected and related. On stage, we create together, with each other. Gravity Arts’s production of the show No Plan B employs a new type of Master Plan, one that incorporates ingredients and creates changing situations where preconceived recipes won’t suffice. The aim is that, in consciously placing ourselves out of our comfort zone, we present who we really are, our values become clear, and we demonstrate our true potential working with and through forces. This is the aim of No Plan B. This project is an example of combining musical and spatial textures in response to external situations. In No Plan B, this involves the creation of an enormous tetrahedron that eventually is elevated and spins on stage. The musicians—the Mobile Trio—and dancers together create the entire art form as textural movements in the collective space, while at the same time always retaining their unique voices. The Mobile Trio, created in 2010, features Schwendener on keyboards, Kenwood Dennard on drums, and Marc Friedman on bass. The trio’s name is an analogy to a Calder mobile, where each component has its own unique identity but is connected on an axis in space and time. The Mobile Trio represents a value philosophy of individuals coming together to create art with “no job to do,” with no preconceived roles to fill. ANGELO: Every single word that you said—it’s vibrating so strong with me. I’ve been meditating on the common points of what we are doing. Music and dance have several axis’ which are like common points when you see them through the angle of the situation: a musician on the stage is facing a situation with his own universe, with his own system of values, with his own instruments, and the dancer is doing the same. 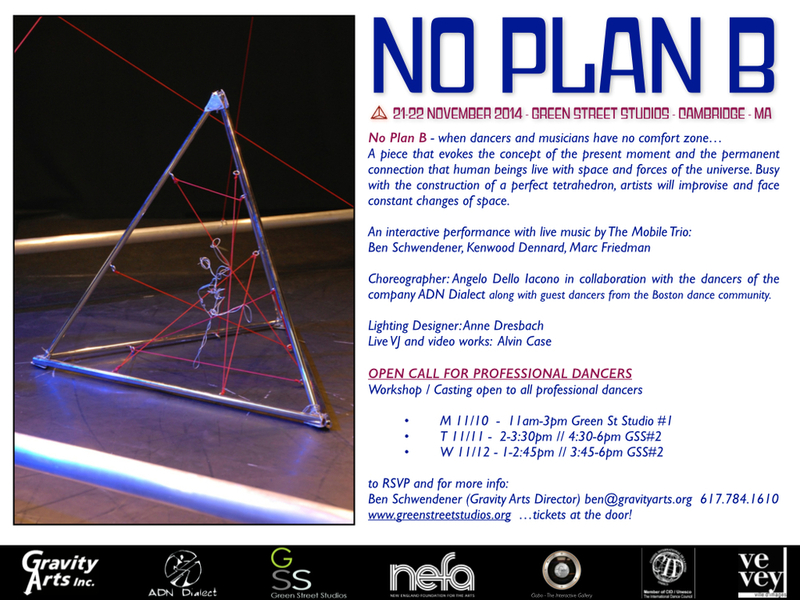 What we have done here with the No Plan B project, with a tetrahedron, is created and materialized a situation for the dancers to be able to play like a jazz musician, like what the Mobile Trio is doing. That means they have to come on stage as they are, and they have to face the situation as it comes. They have to react to the sounds they receive, to situations such as the tetrahedron provides as stimulations, as gifts from the universe. What we do through No Plan B is share a common situation with a common instrument, and we face, make love with the forces of the universe. The honesty that comes out is expressive—it’s a sharing of how fearless we can be today [in 2014] as musicians and dancers when we have the same system of values. time a student of yours comes with his own posture, his own way of breathing, his own energy and in front of his own instrument you probably know what he’s going to play. This is what we are as teachers, as pedagogues. At that point, we have to create situations for our artists to put them out of the comfort zone, out of any box, out of any preconceived behavior. BEN: This is for the growth of the artist, the individual, and the cultural art form. It is in response to needs of the present and the future. ANGELO: The time for jazz to include dancers and musicians in this way has come. And at this time what is needed is an “instrument” such as the tetrahedron used for this project. This shape hides in the very deepness of any alive form. I have done research about the tetrahedron in sacred geometry, and visually what you see is so solid. The dancers who have come recently to my workshops have been playing with the tetrahedron. In the beginning it’s like facing a monster wave in the ocean—you have a surf, and you have to go for it. You know you will have to surf this monster that from the beginning commands respect. The more they play, the more a smile sticks on their face, and they start to get excited about it. The more they play, the more they start to get courageous and fearless, because they feel challenged by the situation. I was missing this since many years in dance. This is what I often miss when I go to see a dance show. I get bored almost immediately because they play from preconceived behaviors. They’re on stage and they know exactly what they are going to do. It makes me kind of, you know, tensionless. But the tetrahedron—no way man! You cannot stick the eyes out of it, because it moves and its dangerous, so it needs respect. It’s like life: watch your steps! BEN: The need for this inclusive relationship you mentioned is interesting, because in the early days of jazz, the 1920s and 1930s, dancers and musicians did perform regularly together, at hundred of clubs in New York. The music, the collective improvisation relied on and was energized by each others’ presence together on stage, in the ballroom, and the audience was an active part of it. Later, for whatever reason, jazz came to be performed primarily in concert-like settings, without dance. Audiences were obliged to sit and respectfully listen. In terms of what you say about providing situations for artists to perform out of their comfort zone, we’re on the same page. Students in the class I teach at the New England Conservatory are world-class jazz musicians, but the kind of material I present to them is different from traditional method-based approaches. It’s modal and based on universal objective principles such as Tonal Gravity, ancient ladders and circles of fifths, and organizations with centers of gravity that have correspondences outside of music, like to the solar system, Pythagorus, and physics. These students compose original works using these materials and, after we play their pieces, they improvise. But they have to improvise in a new way and use these materials, these raw ingredients. I see these musicians who could play convincing jazz in any club in New York really being challenged because they find themselves, as you said, out of their comfort zone. They are forced to make creative choices from the ingredients, and you see and hear preconceived behaviors knocking up against them—you see this battle that’s happening. Because they care, agitation becomes determination, and much the same way your dancers evolve with the tetrahedron, they emerge with fresh impulses that I believe come from developing and realizing a stronger identity of who they are, of what their own unique voice is trying to contribute. ANGELO: (Laughs) It sticks them into instant present. It’s here and now. BEN: It’s an artistic representation of real life.